For tonight, here is my version of a female wizard. (My husband called her “Gwendolf” and the name stuck. My apologies.) None appear anywhere in the series, but it is for Halloween and I thought it would be fun… And it was fun, even if I used up a year’s worth of French Grey pencils, even if the end result is a little boring. I’m afraid this one is going up a little late tonight, but it’s still the 8th where I am. So far I think I’m doing better than last year in terms of paperdoll consistency. So! Today officially starts day one of my Halloween costume month extravaganza. I foresee a lot of elves in my future, but I like Eowyn and couldn’t help but start with something she might wear. 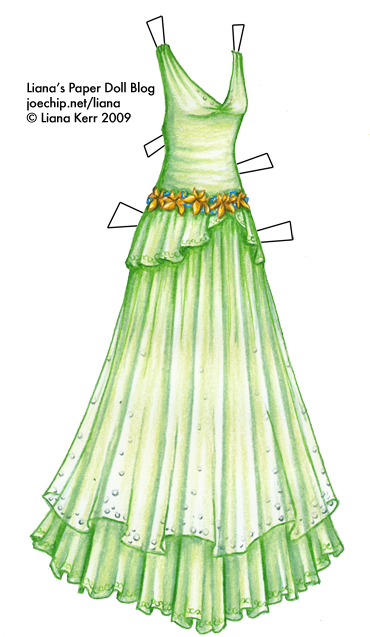 The dress isn’t intended to represent any specific costume from the movie – as much as I like the movie costumes, I won’t just be reproducing them all week because that would be boring – but it is vaguely based on this white gown that I loved. I will try to re-read as much as I can of the Lord of the Rings trilogy this week, but keep in mind I’m not a LOTR geek in the same way that I am, say, a Final Fantasy geek. My mom tried to get me to read The Hobbit when I was younger, and it didn’t hold my interest until I was older for some reason. Although I have read the LOTR trilogy too, of course, it really has been quite some time. 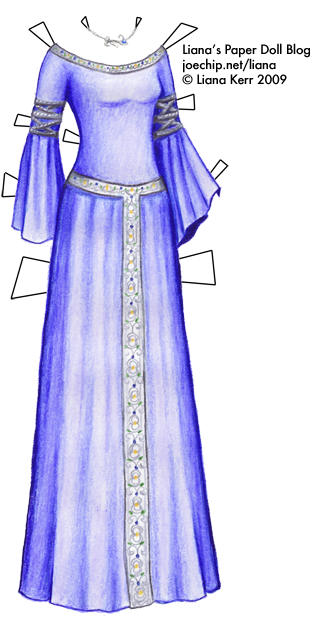 So if I draw an elf dress in some specific shade of purple that the Silmarillion says is reserved for mourning a nephew or something please do forgive me. Here’s the poll for week 2 of Halloween costume possibilities. I dropped the bottom three results from last week, added the suggestions from yesterday’s post and added one of my own… Please vote!